Every once in a while a machine comes along so profound you can do little more than spill profanities as you read through spec sheets and examine photos. The Veyron was the most recent in my opinion. Of course, the holy trinity were impressive beasts but, their numbers were not quite as game changing as Bugatti’s creation. 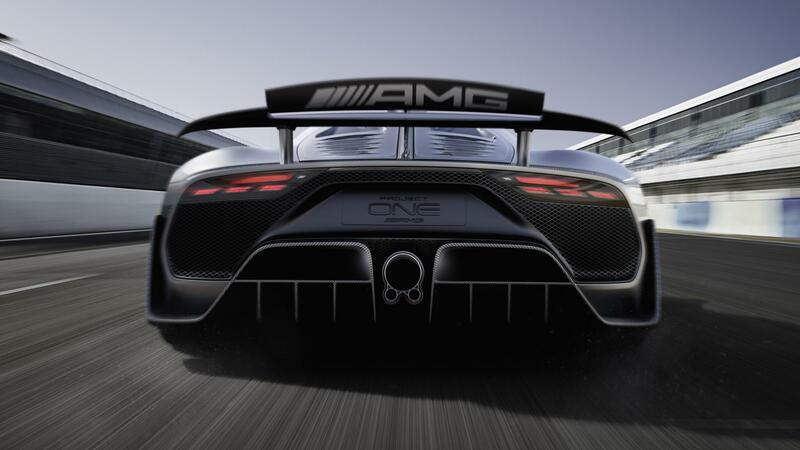 AMG’s new Project One however, is the expletive summoning car that is set to move the game on in ways only the Veyron has previously accomplished. On paper, it’s truly unprecedented. 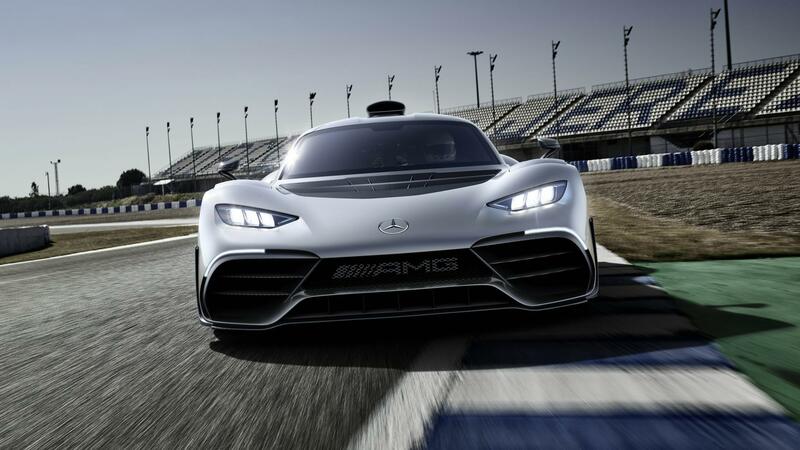 Over 1000bhp launches the project one from 0 to 124mph in 6 seconds. Six f*cking seconds! For context, the Chiron manages the same dash in a pitiful 6.5 seconds while the Laferrari – the quickest of the infamous Trinity – lags behind further still with a time of 6.9 seconds. Top speed is ‘above 217mph‘. 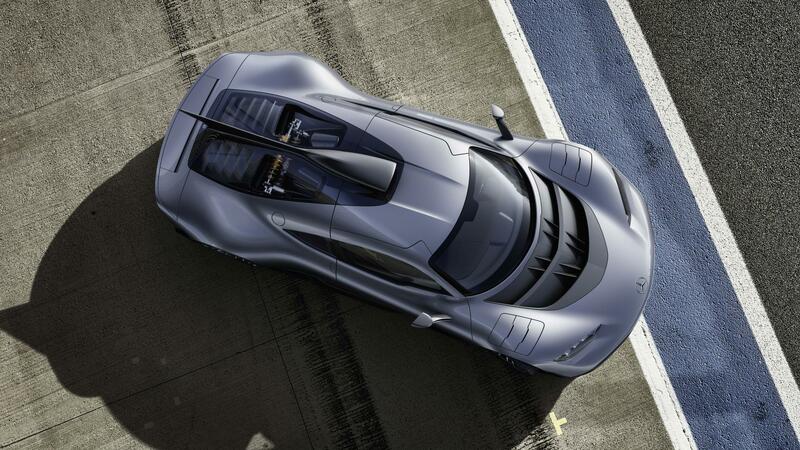 (A coincidence that 217mph happens to be the speed the Mclaren P1 runs out of puff I’m sure). 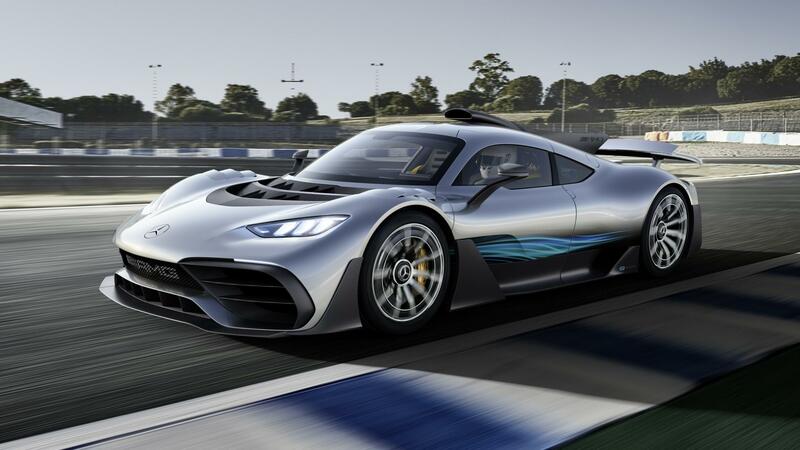 Of course, acceleration figures are not indicative of overall performance, but you can bet your bottom dollar Mercedes has spent many millions ensuring the Project one is equally as effective at rearranging organs in the corners, as it is in the straights. Push-spring struts “installed across the direction of travel,” neutralise any body roll while adjustable coilovers and multi-link suspension attempt to provide some level of comfort. The obscene power comes from a 1.6-litre V6 engine nicked straight out of Lewis Hamilton’s F1 car. Albeit a slightly restrained version, it ‘only’ revs to 11,000rpm, 4k down on the fully fledged limit to ensure the longevity of the engine and because race fuel can be difficult to come by whilst prowling the streets of Knightsbridge. As is quickly becoming commonplace nowadays there are a further two electric motors up front (one for each wheel). 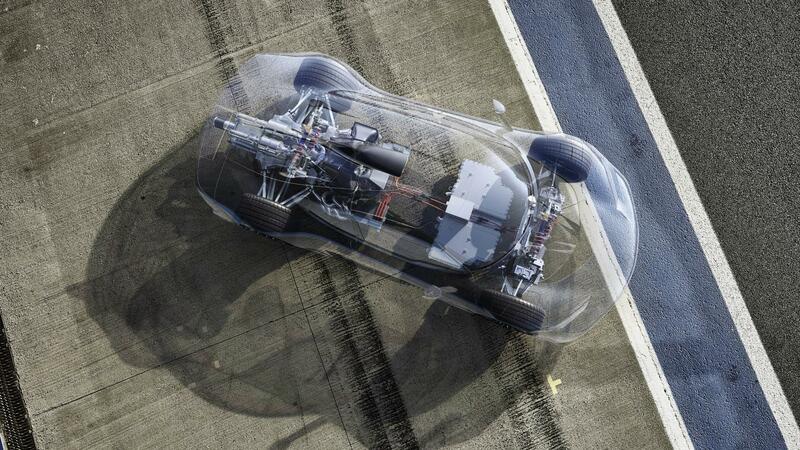 This aids the mind bending acceleration while also opening the door to technologies like torque vectoring. The motors are also able to recoup energy via a regenerative braking system and allow an EV range of 15.5 miles. AMG have employed yet more electrical assistance to ensure that turbo lag is totally non-existent. 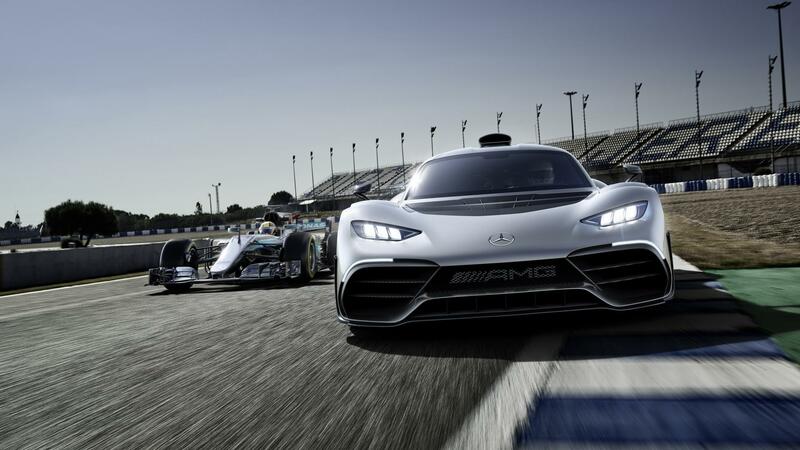 This system is carried straight over from F1 and has been essential to Mercedes’ success since hybrid turbo tech was first allowed back in 2014. In principle, it’s very simple. A generator unit (MGU-H if you want to get all nerdy) is mounted to the turbo’s shaft. When the engine is not a full chat, the turbo drives the generator. Stamp your foot to the floor, the generator then instantly powers a motor that spins up the turbo. Goodbye, turbo lag. 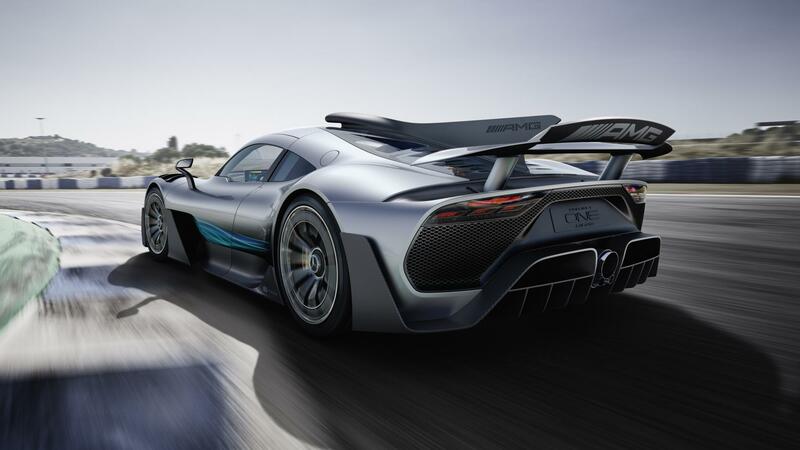 It, of course, goes without saying that this car will have spent an outstanding amount of time in a wind tunnel, so AMG must be commended on the exterior design of the Project One because as crazy as it looks, there can be no doubt the Project One is a road car before a racer – something that peeves me about the Aston Martin Valkyrie. I will concede that the nose looks as though it will fall off at the mere mention of a speed bump, but it follows fairly conventional road car aesthetics i.e you can’t see through half it like you can with the Aston. No official downforce numbers have been given yet, but you can expect the huge aero package will put the KG figure somewhere between utterly ridiculous and simply not possible. The rubber is enormous too. 335 and 285 section Michelin Pilot Sport Cup 2’s wrap around the 20-inch rear wheels and 19-inch fronts respectively. Inside is strangely accommodating. The cabin is bare, but somehow still very Mercedes like. The F1 style steering wheel steals most of the attention while two 10-inch screens angled towards the driver leave the passenger only unlacquered carbon fibre to look at. 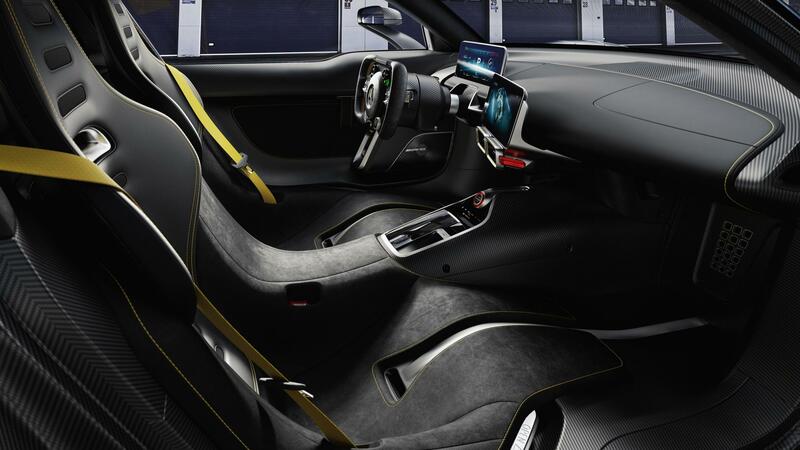 The Alcantara seats are moulded directly into the monocoque which presumably means the Project One will adopt a similar adjustable pedal box to that found in the Laferrari. 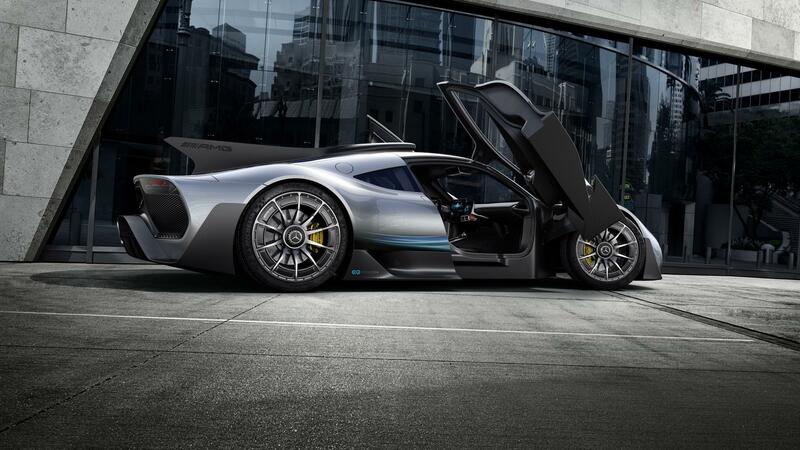 This entry was posted in News, Supercar and tagged AMG.